PepsiCo CEO and Chairwoman Indra Nooyi announced her retirement from the company in August after an extraordinary run of leadership spanning more than 20 years, 12 as CEO. Her second in command, Ramon Laguarta, will assume her role as CEO and take a seat on the Board of Directors in October. Nooyi is handing the keys over to a company veteran as Laguarta has more than 20 years of experience with PepsiCo, most of it in the international markets. 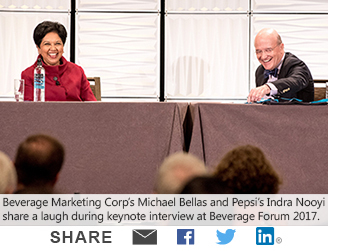 Nooyi has spoken graciously at our Beverage Forum conference, receiving her Lifetime Achievement Award in 2017. This leadership change represents a seismic shift for the company as PepsiCo's recent history has been defined by Nooyi's vision and force of personality. Her Power of One commercial strategy, combining the scale and brand strength of Pepsi's beverages, snacks and food at retail, remains Pepsi's operational cornerstone. She never backed down on that strategic vision, even at times when it appeared she might need to tailor that approach to a changing market. It will be interesting to see how much of her strategy Laguarta will keep and how much of his own vision he will project on the company over time. Over at Coke, newly minted CEO James Quincey moved quickly to make structural and portfolio changes which were long needed and wanted. We think Laguarta will be looking over at the recent changes in the Red system as an example of how to shake up existing sacred cows and rethink long-term company financial goals and objectives, especially for Wall Street. The company's sluggish North America Beverage business is likely to see an overhaul and making Pepsi's $3.2 billion acquisition of SodaStream work will be one of his first tests. Even in light of the addition of SodaStream, Nooyi was shy about acquisition, perhaps to her detriment, and we expect the market will expect PepsiCo to become more acquisitive now that she is moving on. We expect PepsiCo to maintain its focus on innovation in healthier products and move ahead with refranchising its bottler system. The question as always will be how to fix ailing volumes across the North America Beverage business. We expect Laguarta will move quickly to communicate his vision to the market. The timing of Nooyi's departure is curious as at age 62, she is still relatively young for a chief executive and gave few public indications of wanting to leave. However, as visionary as Nooyi has been in shifting PepsiCo's products from indulgence to health, the harsh reality is that PepsiCo stock has not kept up with the market or many of the company's global peers during her tenure. A lagging stock price over a long enough period will catch up with any CEO, even one as personally gifted at Nooyi. There has been speculation that the company's board decided that during this period of operational stability and clear visibility on succession, now might be the right time to execute a change. After so many years of early mornings, late nights and punishing jet lag, it's easy to imagine that Nooyi was amenable to an organized departure, mostly on her terms. It's difficult to overstate Nooyi's importance as both an executive and as a symbol of the changing nature of international business culture. She is among the most visible women in modern business as well as one of the most well-known and powerful immigrants in America. Her personal energy, love of music and love of cricket all have given her a likeable humanity, one often lacking in executives who reach her heights. No one forgets meeting Indra. Nooyi's legacy however will not be dictated or determined by her gender or birthplace - these issues are incidental to a truly monumental success story. Nooyi was a visionary who sought to change the nature of how the highly traditional PepsiCo approached its products, customers, consumers and route to market in a hyper-competitive global FMCG market. Nooyi's personal accomplishments are simply too long to list here, and we won't, but it's fair to say that she is an exceptional, unique talent. Born and educated in India, Mrs. Nooyi moved to America in 1978 to attend the Yale School of Management and promptly worked her way into the consumer sector through Boston Consulting Group first and then into various other roles before coming to PepsiCo in 1994. She became CFO in 2001, CEO in 2006 and then Chairwoman in 2007. During her time as CEO, she shifted Pepsi's portfolio to healthier options, guided the company through the economic crisis and the consolidation of the company's two largest bottlers and fought off an aggressive push by an activist investor. PepsiCo will never be a health food company, but it can certainly make a claim that it has gone full speed ahead on pushing a healthier agenda. PepsiCo grew its portfolio of 'Good for You' and 'Better for You' product options from 38% of revenue in 2006 to roughly 50% in 2017. That will be Nooyi's most important legacy at PepsiCo we believe. In this age of mega-mergers, ruthless private equity acquisitions and aggressive activist shareholders, the speculation about Pepsi's future as a standalone company is unlikely to come to an end any time soon, especially during this transitional period. The demands by investors for more competitive returns will never cease and are likely to pick up with this new CEO, an untested entity. So Laguarta certainly has large shoes to fill, but he's been dealt a good hand to start. He can thank Indra for that. Private Label Beer: Will This Ever Be a Thing? Cider is Struggling: Is This the Canary in the Coal Mine For Craft? Kombucha Tea: Today's Sizzle, Tomorrow's Fizzle?